Stunning 4.5 Star Apartment Overlooking the Nelly Bay Marina. The newest AAA Tourism 4.5 Star Rated development on the Harbour known as Beachside Apartments is the classiest to be built in the precinct. Beachside Apartments comprises a development of 10 Apartments and 10 Townhouses. The apartments are located on the ground floor while the townhouses are located on the first floor. The Apartment which has now become available is located to the end of the building which overlooks the Harbour and Cleveland Bay. Construction was completed in late 2008 and the apartments and townhouses have been operating as holiday apartments since opening. An excellent on-site manager looks after the day to day management of the complex to ensure that all owners obtain the maximum occupancy and excellent income from their investment. 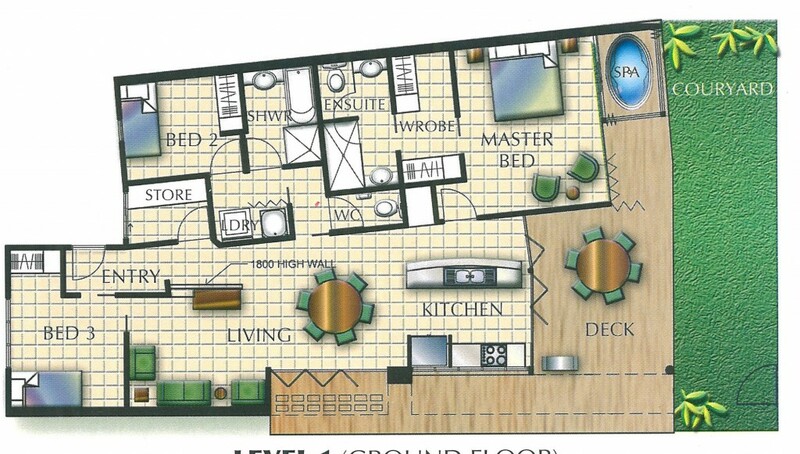 Unit 8 (which is an Apartment) has become available within the complex and it comprises 3 bedrooms, 2 bathrooms. lounge, Kitchen/Dining, Courtyard and Patio. The Master bedroom has spa bath as well as an en-suite and walk-in robe. A King Size bed with bedside tables and a desk are also located in the master Bedroom. The second bedroom has built-in robe and is large enough to accommodate a 2 king singles beds and bedside table. The third bedroom also has built-in robes and a king size bed. The Apartment is fully air conditioned and also has ceiling fans in all the bedrooms and living rooms. A compact laundry houses a washing machine and a dryer and is concealed by concertina doors. Quality furnishings and fittings have been provided including a large Plasma TV in the and a smaller Plasma TV to the Master Bedroom. Quality lounge suites and dining furniture has also been provided in the townhouse. Here's an opportunity to own a quality property that has a good track record for producing an income and is likely to keep doing so for some time to come. Call now to arrange your inspection - you won't be disappointed with the quality, location and presentation of this outstanding investment.